Cucumbers originated in India from Cocumis hystrix where a great many varieties of cucumber have been observed. It has been cultivated for at least 3,000 years, and was probably introduced to other parts of Europe by the Greeks or Romans. Records of cucumber cultivation appear in France in the 9th century, England in the 14th century, and in North America by the mid-16th century. The cucumber is listed among the foods of ancient Ur, and the legend of Gilgamesh describes people eating cucumbers. Some sources also state it was produced in ancient Thrace, and it is certainly part of modern cuisine in Bulgaria and Turkey, parts of which make up that ancient state. From India, it spread to Greece (where it was called "oikuov", sikyon) and Italy (where the Romans were especially fond of the crop), and later into China. According to Pliny the Elder (The Natural History, Book XIX, Chapter 23), the Ancient Greeks grew cucumbers, and there were different varieties in Italy, Africa, and modern-day Serbia. According to Pliny, the Emperor Tiberius had the cucumber on his table daily during summer and winter. The Romans reportedly used artificial methods (similar to the greenhouse system) of growing to have it available for his table every day of the year. "Indeed, he was never without it; for he had raised beds made in frames upon wheels, by means of which the cucumbers were moved and exposed to the full heat of the sun; while, in winter, they were withdrawn, and placed under the protection of frames glazed with mirrorstone. Reportedly, they were also cultivated in cucumber houses glazed with oiled cloth known as “specularia”. Pliny the Elder describes the Italian fruit as very small, probably like a gherkin, describing it as a wild cucumber considerably smaller than the cultivated one. Pliny also describes the preparation of a medication known as elaterium, though some scholars believe he was referring to Cucumis silvestris asininus, a species different from the common cucumber] Pliny also writes about several other varieties of cucumber, including the cultivated cucumber, and remedies from the different types (9 from the cultivated, 5 from the "anguine", and 26 from the "wild"). The Romans are reported to have used cucumbers to treat scorpion bites, bad eyesight, and to scare away mice. Wives wishing for children wore them around their waists. They were also carried by the midwives, and thrown away when the child was born. Charlemagne had cucumbers grown in his gardens in 9th Century France. They were reportedly introduced into England in the early 14th century, lost, then reintroduced approximately 250 years later. The Spaniards (through the Italian Christopher Columbus) brought cucumbers to Haiti in 1494. In 1535, Jacques Cartier, a French explorer, found “very great cucumbers” grown on the site of what is now Montreal. Simple salad that shouts “fresh from the garden”. Place chopped tomatoes in bowl. Add cucumber, extra virgin olive oil, parsley, salt, pepper, garlic powder and onion powder, toss well. Gently fold in feta cheese. I like how the "dressing" is simply a combination of seasonings that mix with the juice from the veggies. Yum! Neat history, too! This looks delicious and cool--a perfect salad to utilize the summer veggies while we still have them. 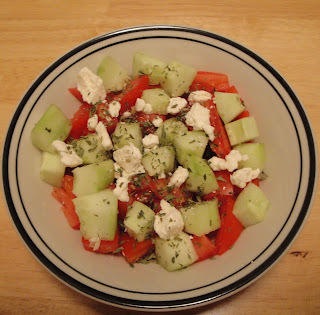 Tomatoes, cucumbers and feta are a perfect combination. 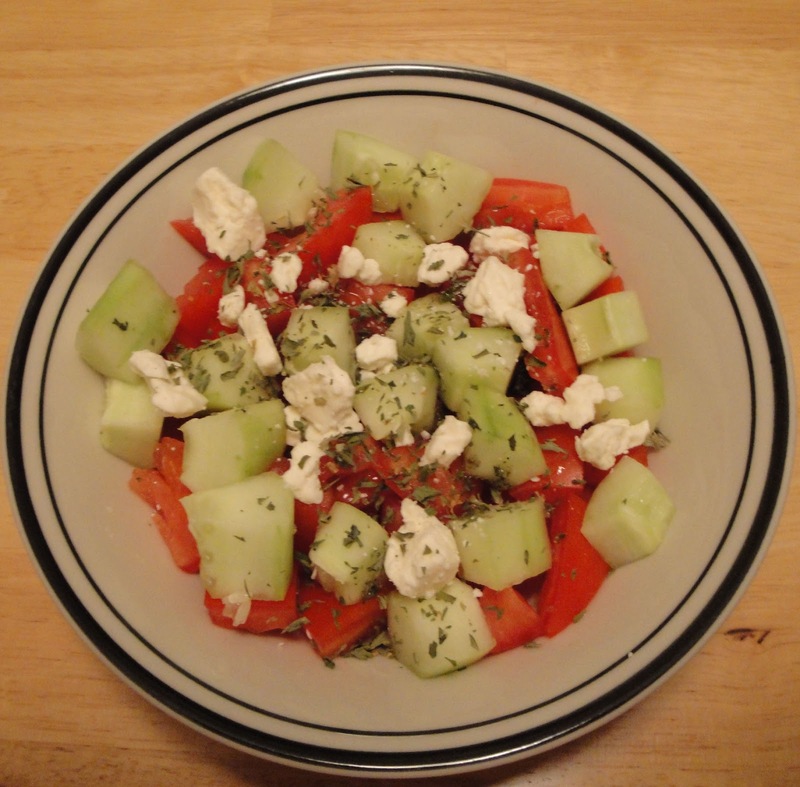 I throw in a little oregano for that "Greek" taste.